Designed by backpackers, the ergonomic frame with padded shoulder straps and lumbar support provides support and stability while allowing air to flow over that operator's back. The weight is mainly distributed over the hip area. Lightweight and easy to maneuver vs. the strenuous use and motion of a traditional upright. An independent study by Swedish based TVA Ergonomic Testing and Ergonomic Consultancy Bureau compared the ComfortPac 10 to three other leading back pack units. The bureau rated the Comfort Pak top in all design criteria. 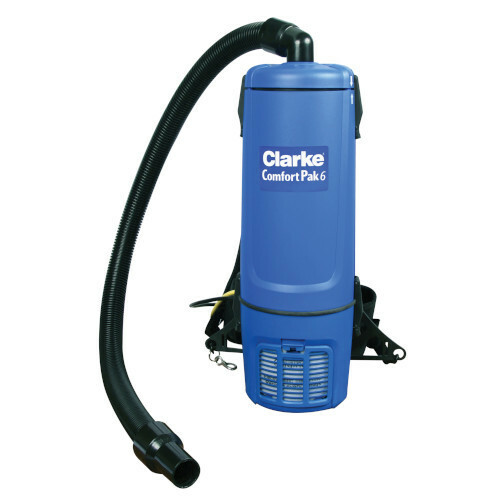 Features: 6 quart filter bag, 62 dB A sound (5-10 points lower than most competitors), 144 CFM air flow, optional H.E.P.A. filter, 99" water lift, 10.8 lbs, 50' power cord, 4 stage filtration standard, 1,300 Watt 10 amp motor, complete set of tools with wand, and 2 year parts and labor warranty. Internet orders are subject to Clarke's Marketing Agreement and may not be available for sale in all areas - please call our office for details.